Mickey’s Not So Scary Halloween Party is a hard ticket event at the Magic Kingdom on certain nights in September and October. Annual Passholders get a discount on some of the party tickets. This party is a great deal of fun. I look forward to it all year. My family likes to dress in costumes and being able to go to a Halloween Party in the Magic Kingdom in costumes is a big draw. I still see plenty of people who don’t choose to dress in costume so don’t feel like it is a requirement. It is just more fun in costume! The crowd levels have been increasing over the years and the number of tickets sold are much greater than a few years ago, although Disney does not release numbers on these parties. The parties are also selling out well before the day of the party, so get your tickets early if you want to go. 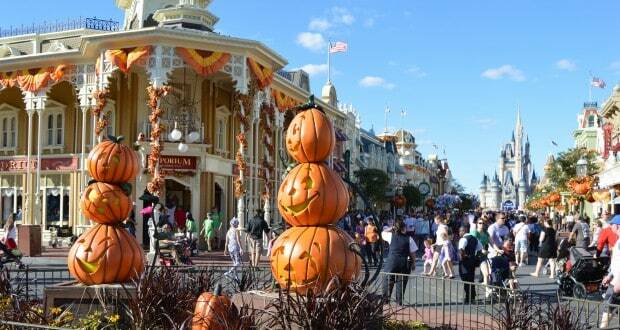 Halloween night usually sells out within hours of availability. We have put together our top tips for you who are planning on going to help make your night even better. If you have an Annual Pass or will be using a day ticket to enter Magic Kingdom earlier in the day it will benefit you so that you don’t have to wait in the long lines to enter the park at 4PM. There are stations inside the park where you can get your wristband, maps, and candy bags without waiting in a long line. This gives you extra time to get in line for a character meet and greet you must have, or see Party exclusive merchandise before everyone else gets to that merchandise location. Get in line for whichever thing is more important to you. Try to get in a Haunted Mansion ride just to see the creative makeup they wear only during the party. Try to eat dinner prior to 4PM or eat right away if not entering before 4PM, you don’t want to waste party time waiting for food or eating a large meal. After dinner you will be ready to enjoy the candy and the special party treats, which are desserts, throughout the park. It is impossible to get everything done that is offered during the party time so make some hard choices and stick with them. The MNSSHP brings out characters you probably won’t see anywhere else, and the classic characters come out in their own Halloween Costumes so picking who you will wait in line to see is important. Get in line as early as possible for high-demand characters. You could be in line for an hour or more just for this one character or grouping of characters. Maybe you should pick just one, or two, to meet this year and plan on getting two more at next year’s party, and so on. If the characters are the most important thing for you, then plan out your evening accordingly. If you are all about the candy, find the Treat Trails that offer you the most candy by either having multiple buckets, or you hear is giving fistfuls over the slight two pieces of candy. Nothing is more irritating to a candy person than to wait in a line where they see large handfuls of candy going in the bags and when they get there the CM is tired, or distracted, and they only get one or two pieces of candy. These tickets are expensive so make sure you leave with your candy bag full. Some Treat Trails may go in different directions each year so make sure you consult the Map to see what it is for that year. If you want to dress in costume, maybe your whole party would like to go together all in the same Theme, such as the Haunted Mansion Ghosts. Make sure everyone has time to create their costume with quality elements, and make this part of the fun as you help each other out. Decide which elements of the party that you want to focus on this year. If one person just wants to enjoy the shows, they won’t be there for a special ride photo unless you plan for them to meet you at a specific time. Study the early release maps that pop up online a day or two ahead of the first party. Scope out the elements you don’t want to miss. Have a plan and stick to it. The Party merchandise for this year’s party is selling out almost immediately so if there is something you want then find out which merchandise location is selling it and head there as soon as you can. If you don’t have a map to preview for the party, get one on your way in to see where the special merchandise and special treats will be located. You can also ask a Cast Member to direct you to what you are looking for. The first parade is very packed with families but the second one is too late for most kiddos to stay awake for and those families do not stick around to see the second parade. Remember the Boo to You! Parade begins in Frontierland and the Frontierland Bridge is a great place from which to view HalloWishes.